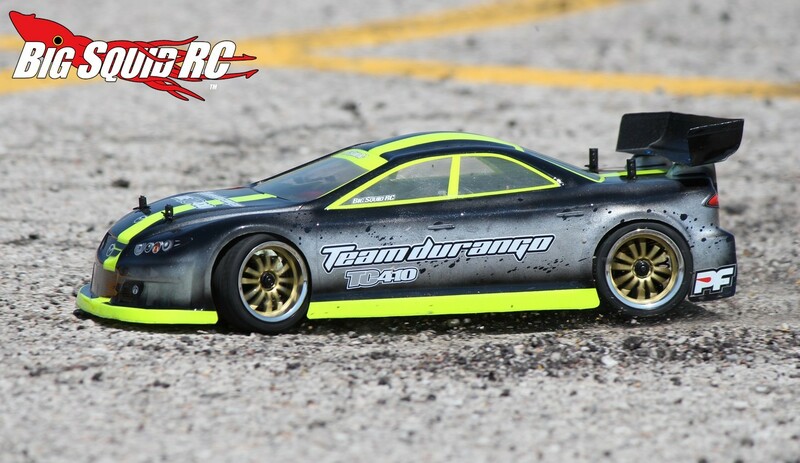 Review – Team Durango DETC410 Touring Car « Big Squid RC – RC Car and Truck News, Reviews, Videos, and More! 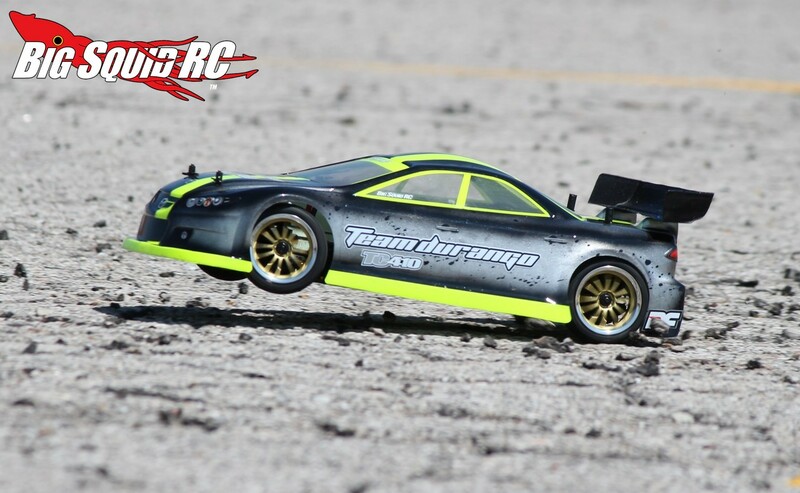 Primary Competition: Other high end touring cars like the Associated TC6.2 and XRay T4 ’14. What’s Needed To Complete: Like many high-end race machines the Durango does not come with wheels, tires, or a body. Also needed to get the car kick’n is a radio, servo, speedo, motor, pinion, shock oil, diff oil, Lexan paint, battery and battery charger. Build Quality: The build quality of the car is entirely up to you as this is a kit. As far as the quality of the parts was concerned, we found every part to be very well made. Test Drivers: “Iron” Mike, Tim “Da Pro” Mohr, Sam “The Noob”, Bobby G, and yours truly. 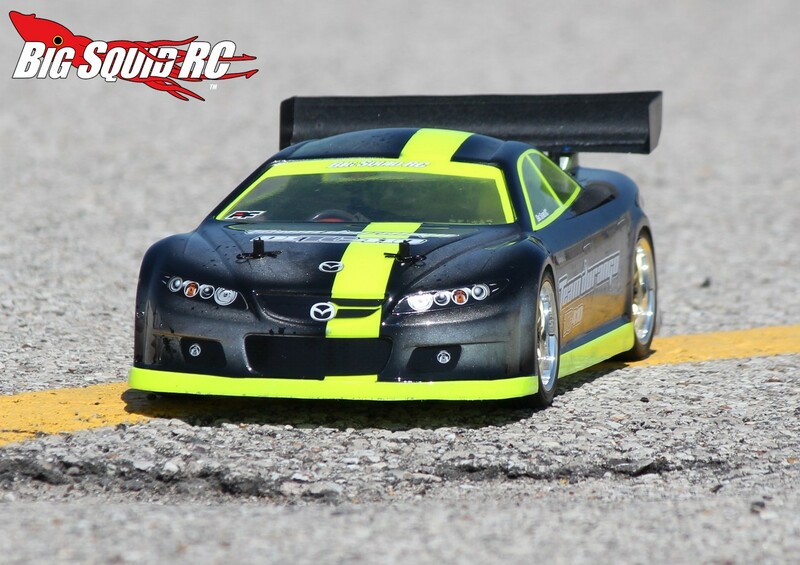 Test Venues: Glidden Park in Collinsville Illinois, a CostCo parking lot, and a fresh patch of asphalt at a city park in St Louis Missouri. 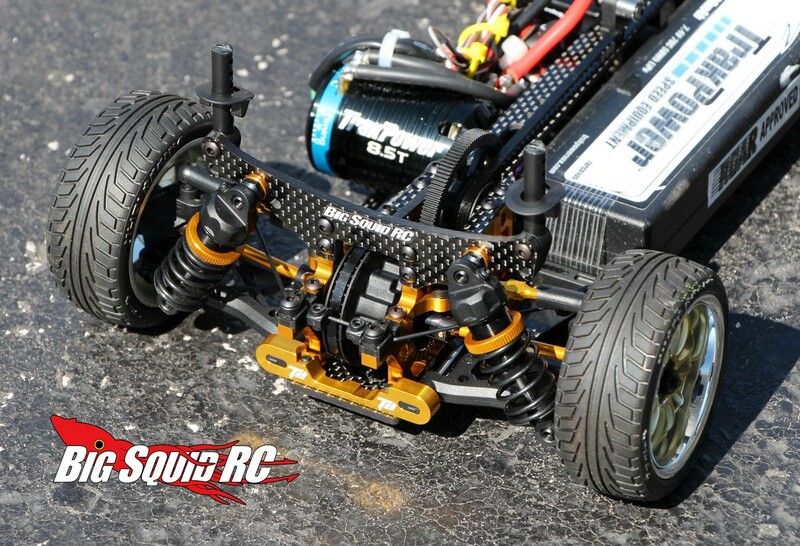 Set-up Notes: For signal we used the best of the best, a Futaba 4PK Super R. For servo duty we called on a Futaba S9353HV, which we used because it is known to be silky smooth. For power we also went with the smoothest combo we could get our hands on, a TrakPower MS-1 speedo with a TrakPower 8.5 sensored motor. 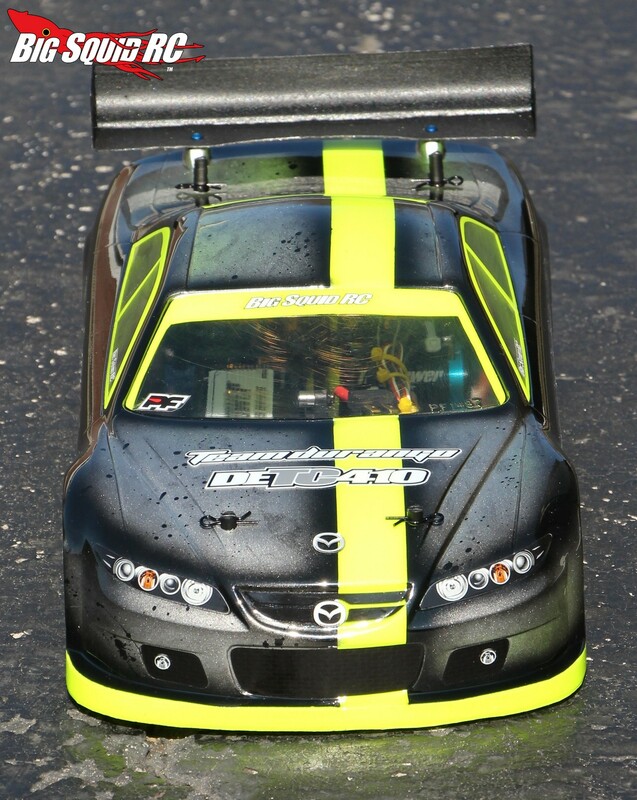 We used two different sets of tires, a set of Muchmore AT-PMA28 racing slicks, and a set of street treaded HPIs. 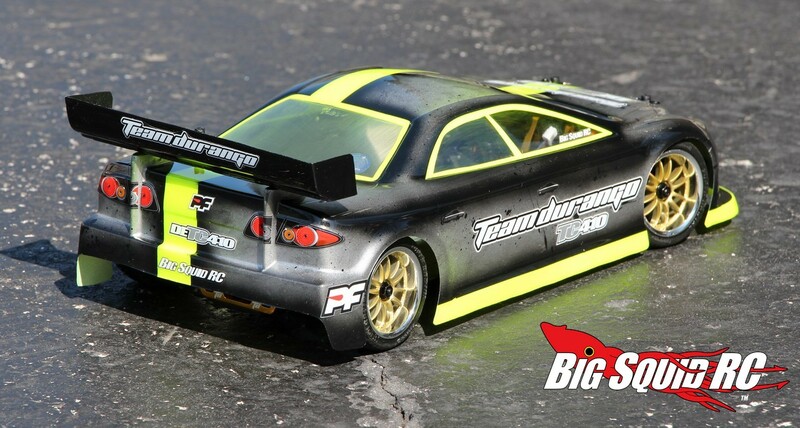 For a body we went with a PROTOform Mazda 6 that had a slick custom paint job applied by Mike over at Blaze RC. For general car set-up we went with the recommendations in the manual. Turning: On a smooth prepped surface the DETC410 is an animal in the corners. 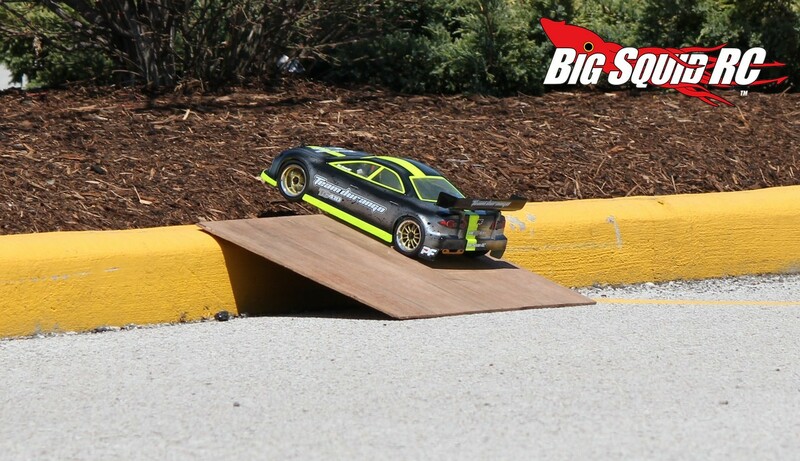 You can totally cook the corner entrance, somehow still make the apex, and squeeze the trigger off on the way out with no complaints from the car. Turn-in is good, it sticks hard mid-corner, and after the apex it is extremely hard to get the out of shape. To boil it down, the Durango has epic cornering, and overall corner speed is phenomenal. Jumping: Come on, we are not going to disappoint you guys, of course we caught airtime with the Durango. 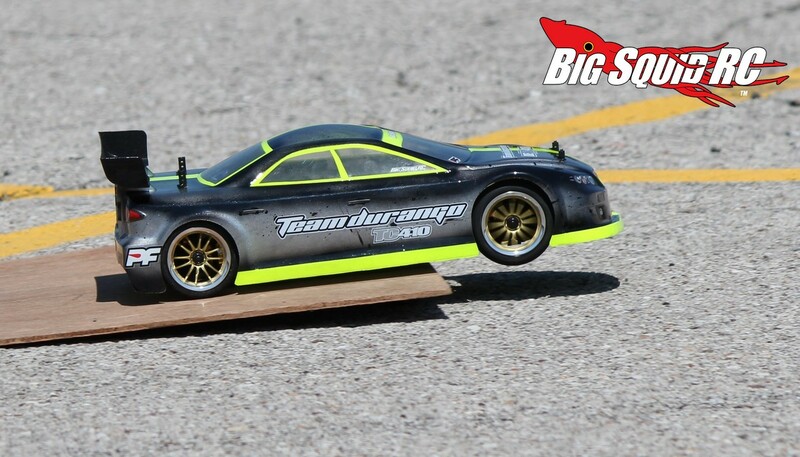 However… while some touring cars you can jump without issue, the Durango is not one of them. The Durango sits really close to the ground, which makes for very poor take-offs, and even worse landings. If you are looking to catch big-air, skip the DETC410, there are plenty of better options in the Durango catalog. 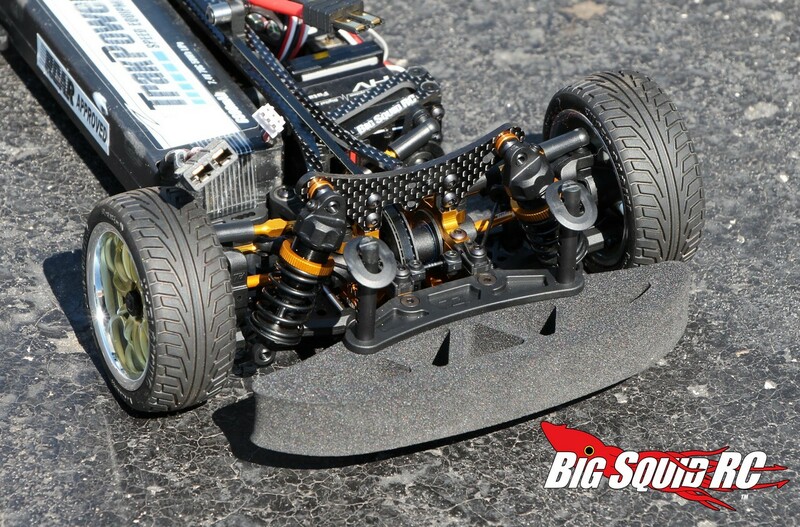 Bumps/Whoops: Because the DETC410 sits so low, it really doesn’t like big bumps, or even small bumps for that matter. Even small rocks you encounter in a “normal” parking lot are bad news for the Durango, they continually get into the exposed belts and stuck between the wheels & hubs. The Durango was never designed for this type of use, and when used in rough areas it will let you know very quickly you are in the wrong spot to play. On-Road: On a smooth/prepped surface the DETC410 is an animal without doubt. If you haven’t driven a high-end race touring car lately, they have really progressed over the last ten years. While we weren’t able to compare the Durango back-to-back with some of its high-end competition, we do know it made us feel like Superman while driving it. The suspension is soooo buttery smooth in the corners, while the low mass drivetrain gave instantaneous response to trigger input. If your friends all drive 4×4 SCTs you can literally drive circles around them with the DETC410 on a smooth surface. Grass: We surely didn’t toss the Durango in grass and try to drive it did we? Come on, of course we did! And no, you don’t want to, even with street tread tires it gets high centered in even the shortest of grass. Broken Parts: Yes, we broke some parts on the Durango, and fairly early in the review process. We must state that 80% of the driving we did with the Durango it was never, ever, intended to do, but still, we are a bashing website and that’s how we test all products. The first thing we popped was the rear drive belt. We had set up a small (very small) jump and the second time hitting it the rear belt broke and abandoned ship. A bit later in the review process we ended up smoking a spur gear. The Durango comes with a 64 pitch spur gear which is exactly what you want for high end racing, but isn’t designed to handle the rigors of powering WFO through a bumpy open parking lot. Everything is so “smooth” on the DETC410. The steering stroke, the shocks, the drivetrain, Durango did an exceptional job engineering the car. The Durango is also very quiet, the quietest car we’ve tested. Some hobbyists are big fans of super quiet, if you are one of those guys you’ll love the Durango. 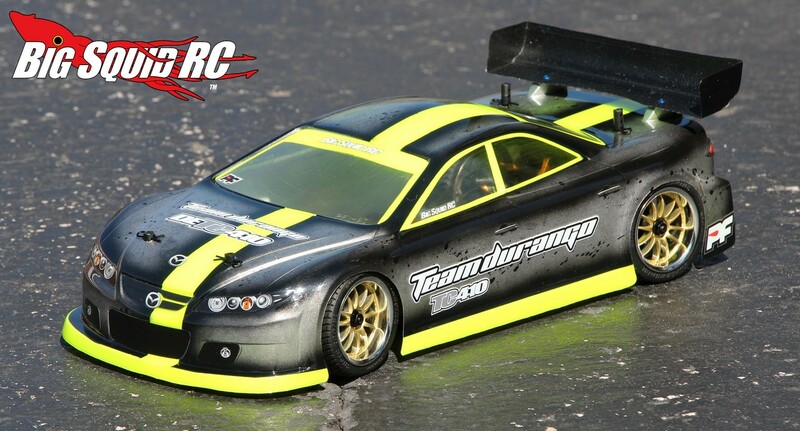 We’ve been building various Durango kits for a few years now. 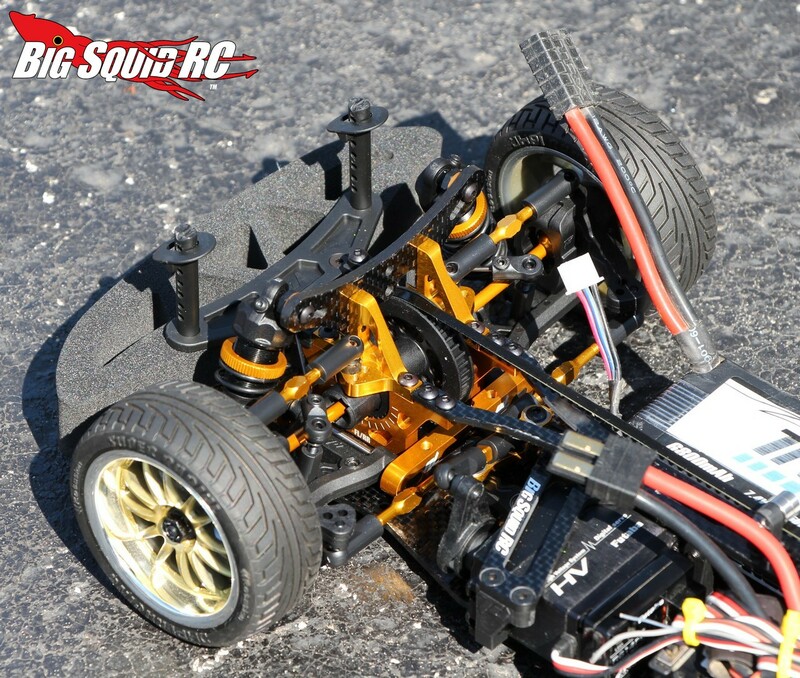 The first kits could be said to be a PITA, but with each newer kit the build process, and quality of the parts, has progressively gotten better. 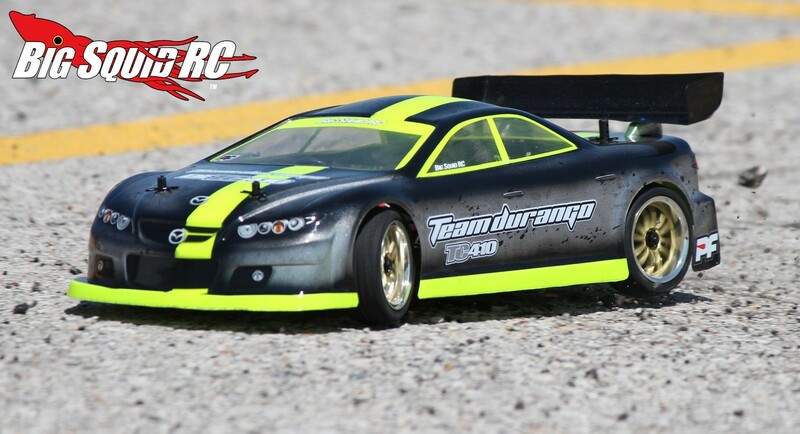 The DETC410 was the best/easiest Durango we’ve ever built, and one of the best kits on the market. If you have never built a kit and want to have an easy time with your first build, the DETC410 would be perfect for you. The manual is very well done, each step has a separate bag that includes nearly all the parts you need, and there is absolutely zero modding required at any step in the kit. We did notice one snafu in the manual, on page 22 it shows to insert part number 330522-1 into the a-arm, when the proper part number is actually 330522-11. The two part numbers are much different parts, thus it won’t mess up the actual build, but out of the entire manual it was the only typo we found. While the majority of the kit flies together, we found one area a bit difficult, the front CVDs. The front CVDs, called D-Joints by Durango, are trick and work well, but they were tough to build. We noted that we had to use pliers to get the pins into the CVDs, when they should have just slipped in. The shocks on the DETC410 were a pleasure to build, extremely easy to bleed properly, and felt awesome while driving, when done. Time To Bash: B The DETC410 was by far the easiest Durango we’ve built, but being a kit you will need to set aside at least 2 or 3 evenings to get it up and running. Workability: A The Durango has a simplistic and very well designed layout, making it the easiest to wrench on touring car that we’ve reviewed. Car Show Rating: A There is a whole lot of carbon fiber and gold anodized aluminum under the hood of the Durango, making it a Bling King. Bash-A-Bility: D The Durango was made for high-end racing, not for pounding around a parking lot at high speed, hence the reason we broke parts on it. Fun Factor: C Our reviewers had mixed feelings over this category. For bashing, the Durango does not fair well. It breaks, it doesn’t tolerate even small amounts of dirt/rocks, and it doesn’t like to jump at all. However, on a properly prepped surface the DETC was a total beast, going exactly where you pointed it faster than you’ve even gone before. In the end, the fun factor is all up to you and where you intend to use it. Handling: C Once again a very split category for the DETC410. It doesn’t do anything well in a typical bashing spot, but on its intended surface it might be the best money can buy. Value: B Compared to the other cars in its category, we feel the Durango is a very good value. It comes with all the high-end goodies, yet sports a street price of $399, much lower than others in its class. Parts Availability: C The DETC410 is a new platform, so it will take a while for more parts to get out there. The belt we broke was in stock at various outlets, while the spur gear we need shows an availability date of late July. 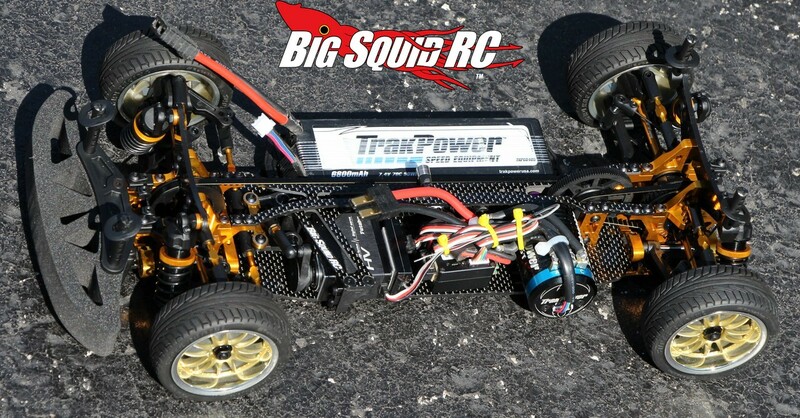 BigSquid Rating: B- We’ll be right up front here, if you intend on strictly bashing, the DETC410 is not the car for you. 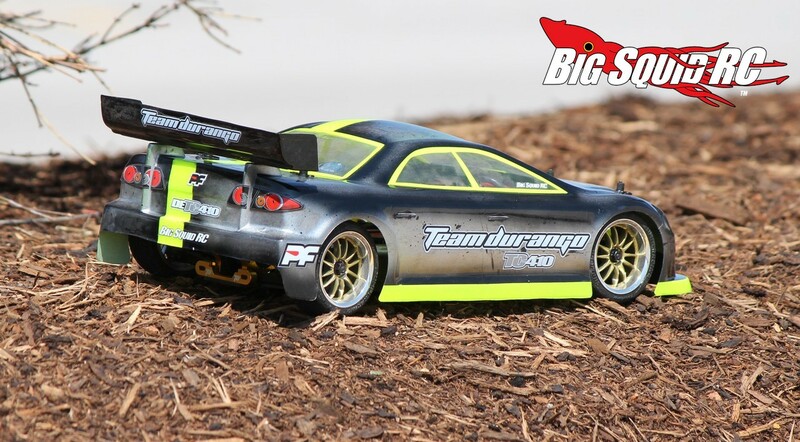 However, if you plan on driving on prepped surfaces, or are looking for a high-zoot touring car for a project build, racing, or drifting, the Durango is a great option.